Is trying a 12-year-old in adult court for attempted murder cruel and unusual punishment? In 2009, Slender Man was created “to formulate something whose motivations can barely be comprehended, and [which caused] unease and terror in a general population.” Some followers on the internet have acted out in attempts to please the fictional character. 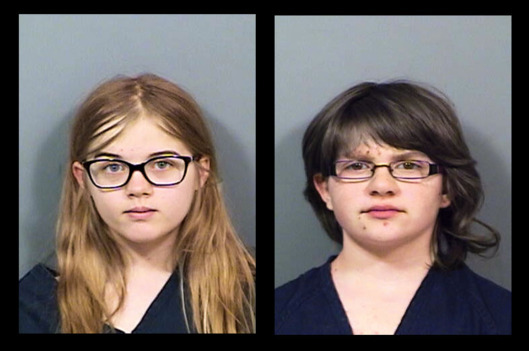 During a sleepover in 2014 in Wisconsin, two 12-year-old girls, Anissa Weier and Morgan Geyser, lured another girl, Payton Leutner who was also 12, in to the woods. They planned to kill her, believing that if they didn’t, Slender Man would harm their families. One of the girls changed her mind while the other stabbed the victim 19 times. The girl survived and her attackers were taken into custody and charged with attempted murder. In August, 2015, a Wisconsin judge ruled that the girls would be tried in adult court. Wisconsin law allows children of ten years of age to be tried in adult court if charged with first-degree attempted murder. Other states have similar laws. The judge calling the crime vicious and premeditated stated that “There has to be assurance to the public–and to these defendants as well– that a serious offense has to be dealt with on a serious basis that offers protection to everyone.” The lawyers for the girls argued that sending them to adult court amounted to cruel and unusual punishment in violation of the Eighth Amendment. They have asked an appeals court to review this decision. Consequently, the trial scheduled to start in October, 2015, was postponed indefinitely. In April, 2016, a court declined to reduce the $500,000 bond set for each girl. They remain in jail pending trial. Morgan Geyser pleaded guilty to attempted first degree intentional homicide and awaits sentencing. The second girl, Anissa Weier, pleaded guilty to attempted second degree intentional homicide and was sentenced in December, 2017 to 25 years in a psychiatric hospital. Her term was scheduled to start from the time of the crime. She’ll be 37 when she’s released. The victim, Payton, also known as Bella, turned 15 in February, 2017 and is reportedly excelling in high school, taking AP classes and moving forward.